Here at Cattaneo Commercial, we believe Surbiton provides an ideal location for all kinds of businesses. 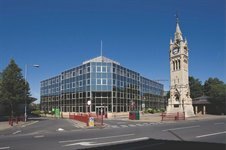 We are the local area specialists when it comes to commercial properties, with our headquarters located just a 20 minute walk from the town centre. We currently have a fantastic selection of industrial and retail properties as well as office spaces available in this charming town. The properties range from spacious, modern offices to industrial units, and even include select spaces at the very heart of Surbiton’s historic town centre. Located in the picturesque county of Surrey, famed for its open green spaces and countryside, Surbiton residents enjoy the convenience of being just a 20-minute train ride away from Central London, combined with the tranquillity of living outside the rush of city life. Surbiton is home to a number of monumental and listed buildings, including the station, which is grade II listed and considered to be one of the best examples of art deco architecture in the whole of the UK. Other notable buildings include the clock tower, which was built to mark the Coronation of King Edward VII in 1902 and a whole host of Victorian buildings in the Oakhill conservation area, described as an area of special architectural and historic interest. It’s well acknowledged that green space has a positive effect on mood and general wellbeing. Green and blue spaces – both of which Surbiton offers plenty - help alleviate stress and calm the mind. Set along an attractive meandering loop of the Thames, Surbiton offers plenty of opportunity for pleasant, riverside walks. Furthermore, just outside the town itself, Surbiton is situated in-between not one, but three of the largest and most popular parks in London – Richmond Park, Bushey Park and Wimbledon Common. Surbiton has enjoyed exceptional railway service ever since it was first founded – trains run regularly from the town to Waterloo, with journey times often under 20 minutes. There are also a number of TFL and local Surrey buses serving the area, and Surbiton is located near both Heathrow and Gatwick airports. Excitingly, if approval is granted for the proposed Crossrail 2 project, Surbiton will soon have yet another convenient link to central, and north, London. 5) Great bars, restaurants – and a farmers market! Surbiton high street is populated with a number of independent coffee shops, restaurants and welcoming pubs – giving you plenty of options for post-work drinks and dining! The Press Room for coffee, The French Table for food, and The Antelope pub are just a few that we recommend. The town also boasts a thriving Farmer’s market, occurring once a month on Maple Road, where local farmers, bakers and producers all gather to sell a mouth-watering selection of fresh fruit, vegetables and more. For more information on letting, renting or investing in Surbiton please contact Adam Soliman at adam@cattaneo-commercial.co.uk, or call us today on 020 8546 2166.